Located on Canada's West Coast since 1991, this profitable seafood processor is primarily a wholesaler and distributor. Wholesale seafood to the U.S., Europe and Japan account for 65% of gross seafood revenues; provincial seafood wholesale at 25% and retail at 10%. They have become a dominant provider of North American tuna exports to Japan. A major strength of the business is its diverse revenue stream - they custom offload and process fresh seafood; buy and sell seafood products; operate a retail seafood store, trucking division and a commercial fuel dock. Revenues can fluctuate based on the cyclical ebb and flow nature of salmon runs with every fourth year being a peak year. Capitalizing on the existing infrastructure, the new owner can substantially increase gross revenues by adding product lines such as Halibut, Russian Halibut, Crab and Eastern Canadian Crab. Within close proximity of Vancouver?s export port, the location is conducive to international growth. They meet Quality Management Policies and Requirements (QMPR), Hazard Analysis and Critical Control Points inspection (HAACP), are federally registered for export, approved for export to EU, and approved for export to USA. 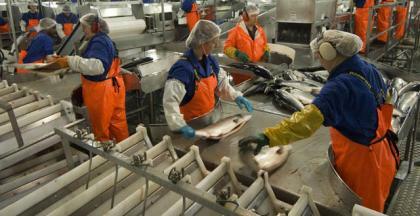 They meet the strict standards set by Japan for the quality for imported seafood. Their recently developed relationship with China will also result in further increased revenues. The company?s 5-year weighted revenue is $21,000,000 with an equally impressive EBITDA of $1 million per year. Asking price includes $850,000 NWC and book value FF&E of $730,000. In addition to $1,300,000 EBITDA, the owner gets paid $170,000 annually. Recent comparable companies in this industry have sold in the 5X to 6X EBITDA multiple. For more information, please contact Michael Naprawa below.